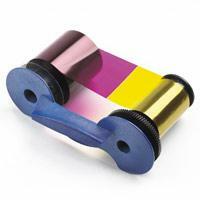 Includes one ribbon, one isopropanol cleaning card, and one adhesive cleaning sleeve, 250 image prints per roll. The ribbon is used to print in a variety of colors: yellow (Y), magenta (M), cyan (C), and black (K). The remaining topcoat (T) provides an extra layer of protection for the card. This card is used to print color on one side of a card. Compatible with SD160 Printers.